I love this place. I visited back in 2006 when I studied abroad but don't remember it being so beautiful. Maybe it was because I had been living in Italy for so long at that point that I was immune to the beauty. It has happened to me in Germany where castles have lost their allure. Yes, a 700+ year old castle. As ridiculous as this sounds, once you've seen 20 they are not as exciting as they once were. I never thought in my lifetime that I would write that sentence. Although I guess I would compare it to anything - if you live in the mountains you take them for granted, if you're on the beach you gets used to the waves. But Florence, what a city. Here are some of the things we did over a long weekend. Seen from the skyline and throughout many parts of the city, it's hard to miss this beautiful and imposing church. The Duomo in Florence is the 4th largest cathedral in the world behind St. Peter's in Rome, St. Paul's in London, and the Duomo in Milan. One of the most recommended must-do's we were told was to climb the stairs to Piazzale Michelangelo. Everyone told us the views at the top were well worth the short hike up. Once we climbed to the top we understood the hype. Just look at the photos below! The Old town area in Florence is quite large. You could spend half a day walking the narrow winding streets. Stop at a local cafe, visit some shops, or just meander around taking photos. We only had a few days in Florence. I like museums but also don't want to spend an entire trip indoors staring at paintings. I will, however, spend half a day happily doing this. So we decided to visit the Uffizi Gallery on our last morning in the city. We were told to book ahead because the lines would be really long to get tickets. We quickly discovered that wasn't the case. There was actually no line and we walked right up to get our tickets. It was a Sunday in November so that might have to do with the ease of entrance. The museum was huge and the building itself was very impressive. We were there for about 2-3 hours. You could spend as little as an hour or over 5 hours depending on your interest in paintings and (some) sculptures. Do you like good wine? How about good wine at an authentic vineyard in Tuscany? There are a lot of different tours to choose from and we decided on The Grape Escape tour by Italy on a Budget. Overall it was a great tour. A few times it felt a bit rushed as we had two wine tastings and a visit to San Gimignano within an 8hr timeframe (and drive times in between). I had read that some reviewers felt this way but we wanted multiple experiences in a day. Overall it was a really fun day and I recommend getting out to the countryside to taste delicious Italian wine straight from the local grapes. The last stop on our tour was the medieval town of San Gimignano. If you go to Florence, both Siena and San Gimignano are only about an hour away by car or bus and both are well worth a visit. I had been to Siena before and was excited to see San Gimignano. Both are medieval and high on hilltops overlooking the Tuscan valley below and quite beautiful. Also, I've never been to Manhattan so I have zero reference, but do you see the similarities?! Our guide told us it looks like the Manhattan skyline, so I will blindly believe him. Just look at these streets! 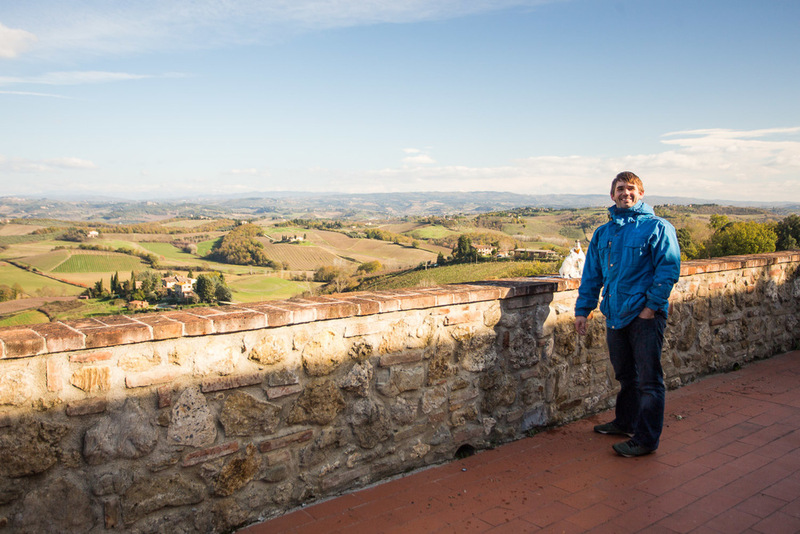 As it turns out, San Gimignano is also home to the former Gelato World Champion. Who knew?! Have you been to Florence?